The government on Tuesday rolled out a new mandate that says that AADHAR number is a must to file IT Returns. The said development has been announced in readiness to the Budget 2017. Also, mentioning AADHAR has been made a compulsion to apply for PAN under the newly issued official orders by the Income Tax Department. More specifically, from July 1 onwards, the implementation of the said development will be enforced by the law. Further, the said move is going to upset those activists who had earlier said that Aadhar number’s use while declaring the IT returns must be a personal choice of an individual and its use should be made voluntary. 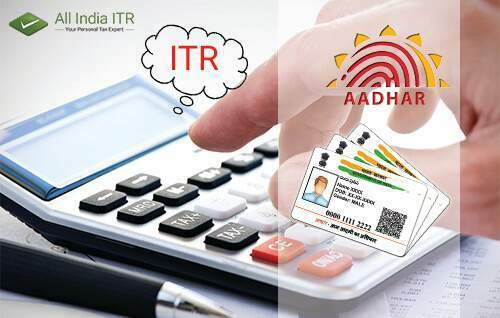 However, a mere mention of your Aadhar enrolment number can also serve the purpose while filing ITR, AllIndiaITR helps to fill your income tax return online. Besides, not stating your Aadhar number can lead to the invalidation of your PAN card by the authorities under the new directives laid by the Income Tax Department. Mentioning Aadhar had been optional for filing ITR returns for a few years in the past but the challenges will appear in the cases where the foreign nationals are paying taxes in India. According to Kuldip Kumar, leader (personal tax) at PWC India – “We need to thoroughly go through the amendment in order to understand its implications”. The said amendment however also stated that the government is also going to specify exemptions under the mandatory Aadhar rule very soon so as to make things more transparent and beneficial for everyone. Another mandate stated in the recent Finance Bill says that making or accepting a payment of an advance of Rs. 20,000 or more in cash for purchasing immovable property is prohibited. Besides, mentioning PAN has also been made mandatory for purchases of more than Rs. 1 lakh. Filing IT returns as of now has already been made much easier than ever with the availability of government’s own website for the said purpose. However, the latest mandate making it a compulsion to mention PAN has made it almost impossible for an individual or a business to keep black money. Further, with the help of Aadhar number, the IT department can have a clear idea of all your bank accounts which you hold at present in the country. Besides, this latest measure taken by the government also comes under Verification Methods Used in Income Tax Return Filing. These all means of keeping a check on black money and undisclosed income are surely going to pay off soon while making the Indian economy grow at a much faster pace at the same time. These cumulative measures being taken by the government are seen as a result of a positive thought of mind of the senior officials in the IT department. Also, there is a positive hope of a monetary increase in the collection of taxes after the said IT return filing mandates comes into the effect. Next articleWhat will get Cheaper and What Costlier with GST ROLLOUT? None of the tax or investment blogs or websites provide such details. It’s really great that u take initiative to tell people about this and your way of representation of thought is really good.